Review by Lavachickie: 12th Street isn't an area that usually inspires one to lunch. 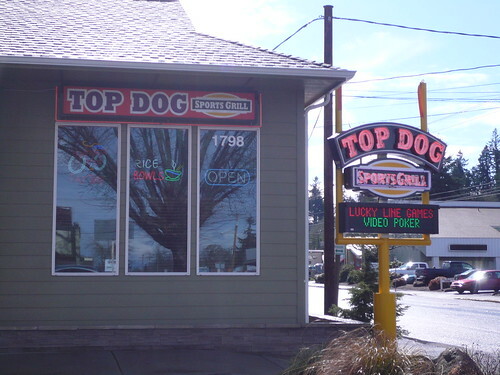 But the bright colors on the newer building that houses Top Dog Sports Grill has drawn my attention a time or two. Then my eyes took in the neon signs for noodle meals mixed in along the usual sports bar brew signs, and my curiosity was piqued. Stepping inside a bit before the usual lunching hour, my partner in crime and I slid into a booth with it's own flat screen tv for our specific viewing pleasure. Opposite the wall of tv'd booths is a mega lineup of eight larger flat screens. During mid day it is set to a mix of news, sports and soap operas. As is the style, the walls are chock full of sports ephemera--some authentic, some just marketing posters, and who knows what else in between. Overall the place is spotlessly clean, well laid out and comfy, if you don't mind the distraction of twenty different moving pictures at once. I unplugged the TV at our table for the duration of our stay. The lunch menu was filled with tasty sounding options, and our server gave helpful tips and suggestions. Sandwiches, noodle bowls, salads, I settled on the Crispy Sesame Chicken Salad, and my partner had a Teriyaki Chicken Burger. The wait wasn't long (appropriate for lunch-time), and were plated and presented well. I loved the high backed bowls the salads are served in; a little unique touch to what can otherwise be a boring lunch choice. Both dishes received two thumbs up thanks to fresh, quality ingredients, good portions sized and good production values. What should have been cold was cold, what should have been hot was hot, etc. A cooler behind that bar has a sign for Eng's, and I asked about that, having heard about a now-gone Chinese place on South Commercial called Eng's. Seems it's the same owner; he has another sports bar type place (she couldn't remember the name), and has opened a third down on South Commercial across from the newer Safeway. Hmmm... we'll have to investigate and try those, because from this encounter, someone knows how to run a good place. A visit in the evening on a weekend is in order to see if service levels and quality hold up with a bigger crowd. The lunch flow was slow, so it was a nice low key place to eat lunch. Nice enough for a business lunch, relaxed enough to hang with friends. Seems like a good evening watering hole as well thanks to the full bar, a few games and lotto options, too. Prices were good with just about all items in the $8-10 range. 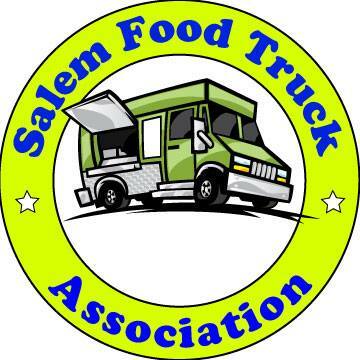 might be a fun place to watch ncaa basketball in Salem. My team lost yesterday, great season Matadors! There are a few place on 12th/13th that are pretty good for lunch and dinner. I've always been curious about this place. Thanks for the pic. Very very slow during the luch hour. We ordered our lunch 10 mins before noon and didn't get served until after 12:30. Also they mischarged my debit card and now I have to go through the claim process to get my money back. This is the 2nd time I've been there during lunch and the 2nd time they've been incredibly slow. While the food was "okay", I will not be going back!! My Brother and I showed up around 5pm to watch the Blazer game and The Yankees/Boston game and I agree with everything you said. Very clean place, lots ov TV's, very relaxing environment. I had the chicken strips and my Bro had the Teriyaki Chicken Burger. I thought portion was pretty small the Burger fit the price as seen in your pic.Pleasent dining experience and will definitely go again to watch sports. Thanks for your review as it was the main reason I gave them a shot. Keep up the good work. My girlfriend and I went in last Sunday night as Sunday Night Football and The Blazers were both on TV. We settled into a spot and looked at menus and all the sudden all 10 TV screens showed only the football game. I asked the server if we could have the Blazers back on and he said "the people in the back room" wanted it off. I strolled to the back and noticed 7 or 8 people playing cards. It seems odd to me that a Sports Bar with 20 tv's can't accomodate a guest that wants to view more than one game. I'm not going back. We've been here several times and really enjoy the clean/fun atmosphere. The food is good but the service we have received needs some work. One Saturday night it took 45-minutes for us to get our appetizers. :( , a good 15 minutes to get a pitcher of beer and 1.5 hours to get our food. We were very disappointed. I decided to have lunch with a friend there recently. It was pretty slow for a mid week lunch hour, so I figured we'd be served quickly. The server was within sight on her cell phone having an argument for a few minutes and her disposition didn't improve as she took our order. The people at the table next to us had a question about their bill and she argued with them. My rice bowl was very tasty and it was a lot of food, so I can't complain about that. The cook came out and she argued with the server. Someone need to get the reins on this place. I was very uncomfortable. I surmised by the number of cars in their parking lot, during the lunch hour, I had noticed on several occasions, that this place probably had something special going on. Today I tried it. It is a sports bar with myriad television sets on the walls, so I was expecting burgers, dogs and sandwiches to dominate the menu. They were present, of course, but to my delight, there was a sizable number of teriyaki offerings. I had a sesame chicken salad which was served with a wonderful dressing on the side. It looked like thousand islands but had a distinct teriyaki tang to it. Also, on the side was a cup of hot chili sauce which gave the sesame chicken a zesty punch. My server was gracious and efficient. Good food, good service and a friendly atmosphere. I recommend this place. The service is slow. Not going back. I get the impression that they really don't care.